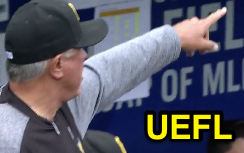 The singing of God Bless America allowed Clint Hurdle to bypass MLB's 30-second Replay Review time limit during Sunday's Pirates-Mets game in New York, thanks to the patriotic tradition of standing at attention during the song's playing. Reynolds explains the sequence to Collins. With one out and one on (R1) in the top of the 7th inning, Pirates batter John Jaso hit a ground ball to Mets third baseman Wilmer Flores, who threw to second baseman Neil Walker to retire Pirates baserunner R1 Josh Harrison, onto first baseman Lucas Duda to retire batter Jaso for an apparent double play to end the frame. Immediately after the third out, as stadiums tend to do, the Mets gameday entertainment team began the Citi Field mid-inning entertainment program, which, because the inning break happened to be the middle of the 7th inning on a Sunday, featured the traditional singing of God Bless America ahead of the ordinary seventh-inning stretch staple, Take Me Out to the Ballgame. Due to the unique patriotic nature of "God Bless America," fans, players, and other stadium personnel were asked to stand and remove hats for the duration of the song, as is tradition, while the TV feeds went to break. Pursuant to Replay Review Regulation II.E.1 ("Inning-Break Mechanics"), broadcasters ordinarily will not go to commercial until the Field Timing Coordinator starts the ballpark timer to commence the inning break. However, Regulation II.E.1 contains an exception: "the case of a special inning-break activity or event approved by the Commissioner's Office (e.g., 'God Bless America') in which case the inning-break will commence at the conclusion of the activity or event." Thus, with God Bless America on the mid-7th docket, the Field Timing Coordinator wasn't planning on starting the ballpark timer until the conclusion of the song, which kept the TV trucks in the dark as to whether the inning was really over: the standing around "dead time" that accompanied the patriotic tune only complicated matters. By the letter of the (outdated) law, the broadcasts should not have gone to break until after the conclusion of God Bless America...but they did. Hurdle waits until after the song to challenge. The Pirates—who were considering filing a Manger's Challenge of the play at second base and legally communicated their intent-to-review the play within 10 seconds of the final out (after a third out, teams have 10 seconds to communicate their intent-to-review, and 30 seconds to decide whether to challenge)—were unable to actually complete this second phase and file the Manager's Challenge during the stand-still-and-observe song, which spanned approximately one-and-a-half minutes in duration and served as a de facto suspension of the 30-second time limit. Yet, thanks to the location of the team's video coordinator in the clubhouse video room, removed from the pageantry of "God Bless America" and its idle observation, Pittsburgh benefitted from over a minute of extra review time before Clint Hurdle could finalize with HP Umpire Jim Reynolds his decision to challenge 2B Umpire Lance Barrett's out call at second base. Reynolds and Barrett are joined by Mr. Met. The review itself—from the moment Reynolds and Lance Barrett applied the headsets until their removal—was fairly short (Barrett's headset was on for about 15 seconds), as the Replay Official, like Pittsburgh, had also been reviewing the play during the lengthy God Bless America, resulting in an overturned ruling and placement of Harrison back at second base—and of New York back on defense—as Replay determined that Walker had failed to properly tag second base: An out in the days of the Neighborhood Play, the rules-correct call in the era of modern Replay Review is "safe." 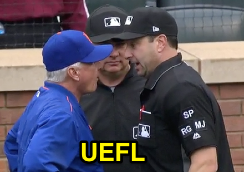 This is not the first time God Bless America has disrupted a Manager-Umpire interaction, though it is the first time GBA has interacted with expanded Replay Review. In May 2013, a dispute between Umpire Tom Hallion, Indians center fielder Michael Bourn, and Manager Terry Francona carried into a Sunday 7th inning stretch at Fenway Park, wherein the three men halted their disagreement during the song. Said Francona, "I told Tom Hallion, "I came out here to yell at you and now I've got to honor America with you.'" 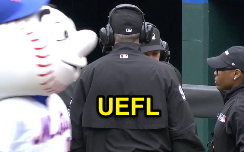 Over the past week, the Mets came face-to-face with MLB's 30-second Replay Review time limit, as Fieldin Culbreth denied Terry Collins' attempt to challenge a play after the expiration of the 30-second window. On Saturday, Culbreth ejected Tigers Manager Brad Ausmus after a similar untimely Replay Review request was denied. Replays indicate Ausmus took 39-seconds to decide to file a challenge, in excess of the time limit.